Arsenal midfielder Henrikh Mkhitaryan will be unable to feature for Arsenal against Qarabag in the Europa League due to security laws in Azerbaijan. Today’s Europa League draw has pitted Arsenal against Qarabag, Sporting Lisbon and FC Vorskla in Group E, with supporters hopeful that the team can improve on last year’s semifinal showing. The Gunners have finished outside of the top four in the Premier League in back-to-back seasons now which sees them make a return to the second tier European tournament rather than the Champions League for the 2018-19 campaign. 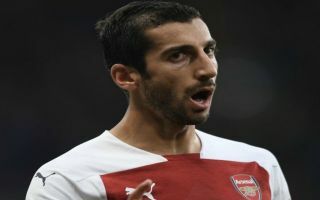 According to Vivaro, as translated in the tweet below from the account ‘afcstuff ‘, manager Unai Emery will have to make do without Mkhitaryan – one of his star players – for the away tie against Qarabag, due to ongoing tensions between Azerbaijan and the midfielder’s homeland Armenia. The 29-year-old has experienced this kind of situation once before at his former club Borussia Dortmund, where he was unable to feature for the team against Gabala in Europe, which is another club based in Azerbaijan – as per afcstuff on Twitter. This latest news is potentially a real concern for Arsenal given the fact that the Europa League final is due to be played in Baku, Azerbaijan come May, meaning Mkhitaryan could end up missing the showpiece event should Emery’s men make it all the way to the end of the competition. In the Premier League, the Gunners will once again have a real fight on their hands to qualify for the Champions League via the top four, so the Europa league could end up becoming their only avenue back into the biggest stage of European football.